Swelling of the legs may be the result of sitting or standing for too long, crossing the legs or even medical conditions related to the heart. Speak with your doctor about any unexplained, unusual or uncomfortable swelling to rule out a serious cause. According to Healthline, you should see a doctor immediately if you have pain and swelling that doesn't get better, along with shortness of breath, chest pain and pressure, or swelling on only one side of the body. Excess fluid in the legs causes leg muscles to become tight and creates discomfort and possibly pain when trying to move around. Add exercises to your daily routine to help pump out excess fluid and relieve tight muscles. Walking helps reduce leg swelling by increasing circulation to the leg muscles. This helps to push excess fluid in the legs through the blood valves and back to the heart. Incorporate walking into your daily routine by getting up every hour or two and going for a five- to 10-minute walk. 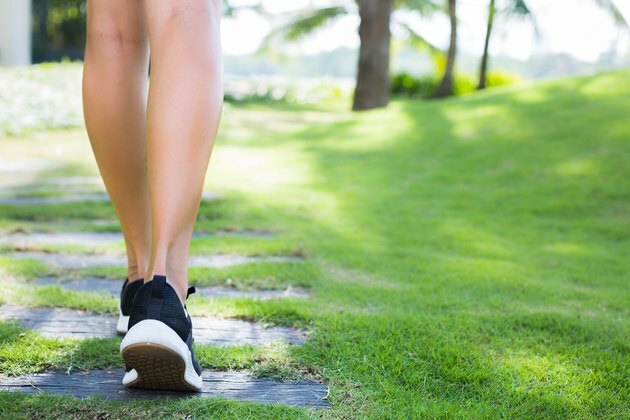 Additionally, start a structured walking program of 30- to 60-minute sessions three to five times per week to improve heart health and increase leg strength. Reduce leg swelling with ankle pumps, which can be done anytime whether you are standing, sitting or lying down. Ankle pumps involve moving the ankle up and down such that your toes point toward your head and then down away from you, toward the floor. This exercise contracts the calf muscle in the back of the lower leg, which aids in increasing circulation to the lower legs and shunting out excess fluid. Do this exercise three to five times per day with anywhere from 20 to 30 pumps for two to three sets in total. Exercising in water can help decrease edema in the legs. Muscle force against the water's pressure helps move excess fluid from extremities. Furthermore, the buoyancy of the water makes for a low-impact exercise that is less uncomfortable and more forgiving on swollen, painful legs, according to the Cleveland Clinic. Try swimming, water aerobics or even walking in the water daily or a few times per week for 30-minute sessions. If you can't get to the pool, yoga offers several exercises for edema in the legs. A favorite is the Legs-Up-the-Wall Pose in which you lie on the floor with your buttocks against a wall and your legs extended and resting on the wall for support. This puts the entire leg above the heart and head, allowing excess fluid to drain and lymph to circulate more efficiently. In addition to exercising to decrease leg swelling, eat a nutritious diet and maintain a healthy weight. Excess weight can inhibit fluid from leaving the legs since it puts extra pressure on veins within the hip region. Certain foods can cause swelling in the legs as well, so you'll want to avoid salty and refined foods, along with foods you might be allergic to. Instead, focus on filling your plate with vegetables, fruits, lean proteins and healthy fats. Drink eight to 10 cups of water per day, depending on your individual needs and activity levels. Healthline: What’s Causing My Swollen Feet? Is There a Natural Way to Get Rid of Fluid in the Body?